I’m not, in general, a ‘cat person’. First, I’m allergic to cats. And more than that, I’ve never understood cats, their aloofness, nor their behavior. But it seems the tables have turned for me, because I’ve become fascinated with the wild cats around here–bobcats, cougars, and the illusive lynx. Bobcat sign has become quite rare these days with the heavy trapping. Bobcat pelts sell for up to $1000. 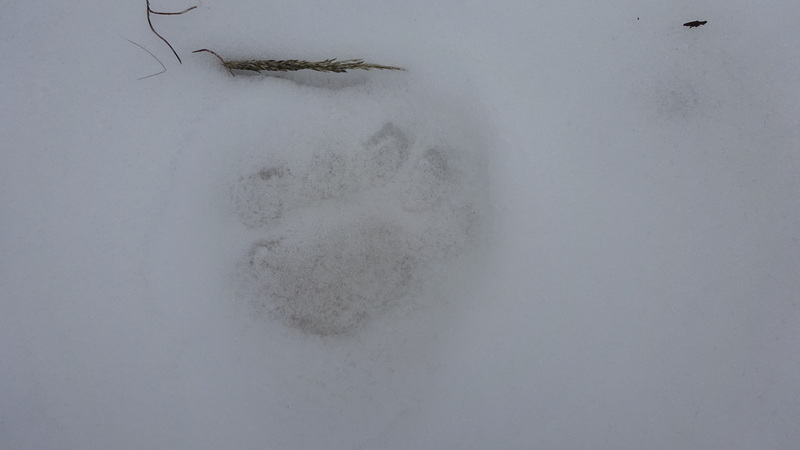 And good luck seeing a lynx or their tracks. One old timer tells me she saw one several years ago by my mailbox, but I haven’t heard of any reported sightings around here. 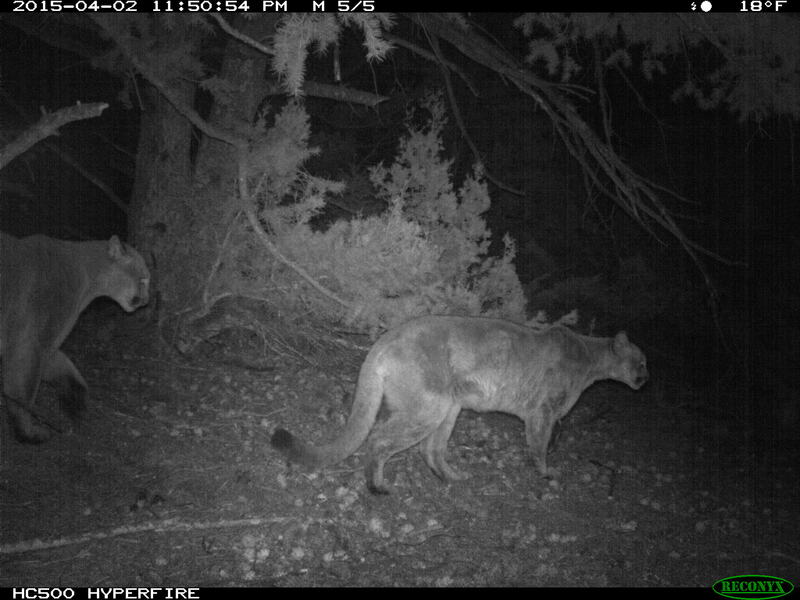 But cougars seem to be abundant. I put my trail cam on a ‘scrape’. Males will mark their territory with scrapes, usually under a big old conifer. Its also a scent post to attract females. If you can find a scrape, that seems to be your best bet of seeing cougars, as well as other animals. The study that’s going on in Yellowstone Park had footage of a grizzly bear lounging on a cougar scrape for a full day! Actually, I placed two cameras on this scrape but the movie one malfunctioned, so I put together a ‘video’ from the stills of my Reconyx. You can see exactly how this big male makes a scrape by twisting his hind back and forth. This male, it turns out, was accompanied by a female. First the male marks, then the female came and scented it using her vomeronasal organ located on the roof of her mouth. Those of you who have cats, have seen your pet smell something then raise their head to take the smell into that organ. Without trying much, I seem to be running into cougar sign. Maybe the class I took with Toni Ruth in January helped key me into how a cougar thinks, what it does, and where it goes. 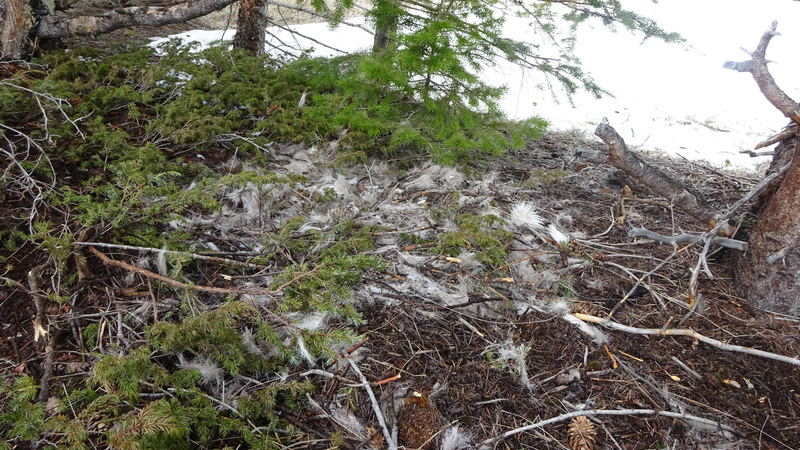 I’ve seen many old cougar deer kills that have been neatly covered, but nothing is left except the legs which they don’t eat. Cats are always very neat and tidy. 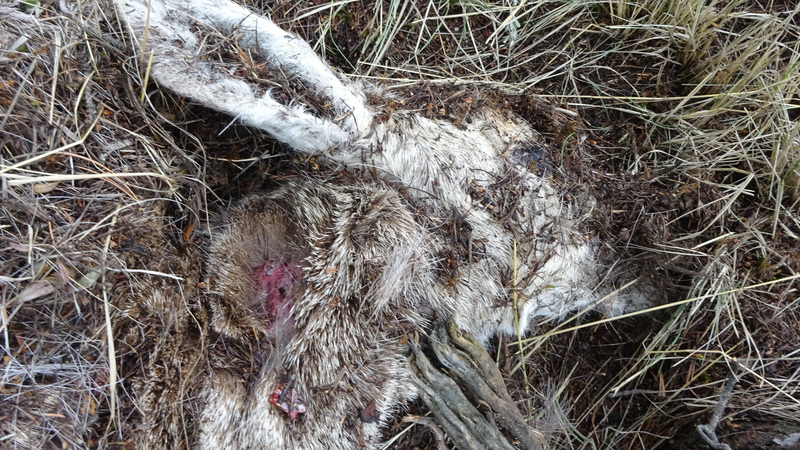 They drag their kills to cover, like under a tree or hidden behind rocks is typically where I’ve found them. And they pile brush up in a circle to cover their kills. This keeps them fresh and reduces scent. Also, the hair of the deer is plucked. Bears will cover their kills but they are messy and use a lot of dirt and sticks. On a short hike in a distance valley miles from where my trail cam sits, I found a fresh deer kill with snow tracks leading to it. I’d never found a fresh kill and I knew that this lion was somewhere in the neighborhood, probably watching me. But I wasn’t worried about the lion. I was worried about bears, so instead of investigating I scouted the entire area first, then backtracked. Bears will defend a found carcass while I knew that a cougar would not. All that had been eaten was the heart, and the kill looked hastily covered. Possibly Koda and I had disturbed the cat, although maybe not because it was the middle of the day. You can see the puncture wound at the neck in this photo. I hoped to catch a glimpse of the cat, but no luck. 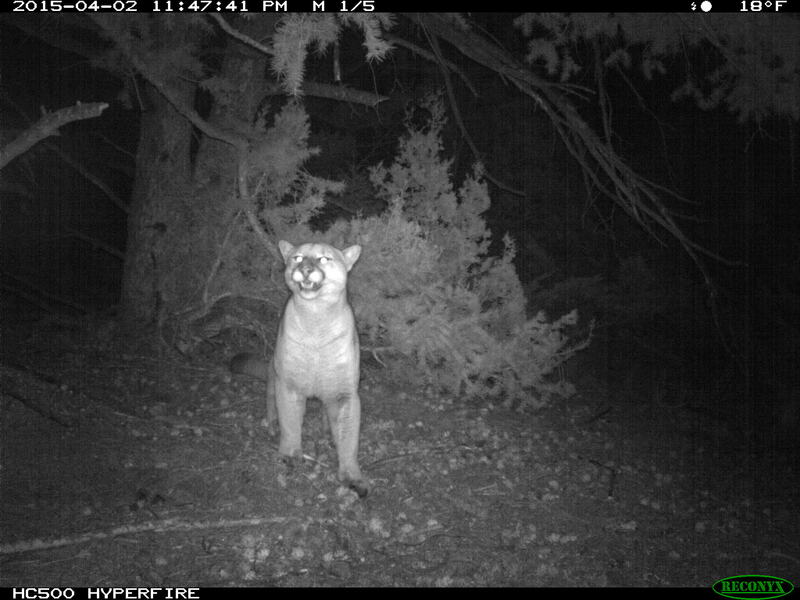 I asked Toni Ruth in her five years of studying cougars at Yellowstone National Park, how many times she saw one, apart from when she used dogs to track and collar them. With thousands of hours of tracking in the field, she’d only seen them three times in five years! I myself have never seen a cougar, only their sign. 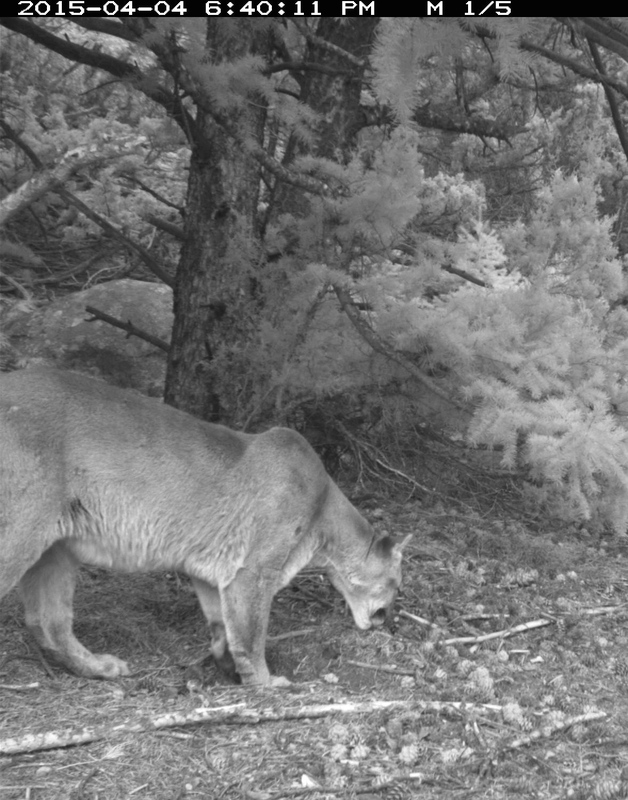 Although cougars have large territories, my trail camera sits in a valley far from houses. A nice plus today in retrieving my trail cam. As Koda and I were almost to the car, I heard a Great Gray Owl.